Oakwood Coaster Country has spent 1.7 million pounds on the craziest aquatic attraction in Europe. 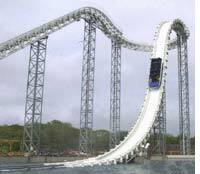 Made by the Swiss constructor Intamin, Hydro (a.k.a. Water's Revenge) is a revolutionary phenomenon. Seated in a 24-seat boat, you are raised 37 meters above ground before you hurtle down a 180° turn, before reaching another summit of 34 meters. And there, brace yourself for an 85° fall awaits you. At the end of the fall the boat reaches 4 G at 80 km/h, generating a wave that is 15 meters high and 40 meters long: the biggest splash ever created by a European aquatic ride. The ride is 260 meters long and you leave wet, and that, for numerous reasons.